The Dodge Viper is a very exciting car. It seems to have been designed to give the driver the most dangerous possible experience behind the wheel, and danger is very exciting. What the Viper isn&apos;t, is practical. With that massive 8.3-liter V10 up front there isn&apos;t much room for anything beyond the driver and one passenger. 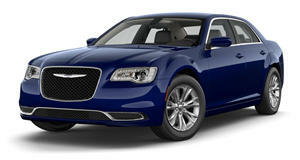 Much more practical is the Chrysler 300C. It has loads of room inside, although the 3.5-liter V6 doesn&apos;t offer much in the way of excitement. I think you know where this is headed. Derek Ekins managed to shoehorn that V10 beast of an engine into his 300C, together with the necessary suspension, transmission and cooling upgrades. The result is harrowing white-knuckle thrills for you and few extra friends. Of course, after spending all of that time hidden away in the garage, you&apos;ll be lucky to still have enough friends to fill all of the seats in a 300C.